Our project for a guest house/spa competition in Latvia titled ‘A Whisper in the Forest’ has been awarded a third prize in the Urban Design & Architecture Design 2018 by APR Magazine. Junko Yamamoto shared the Ghana Public Art project at Leers Weinzapfel Associates (Boston, MA). 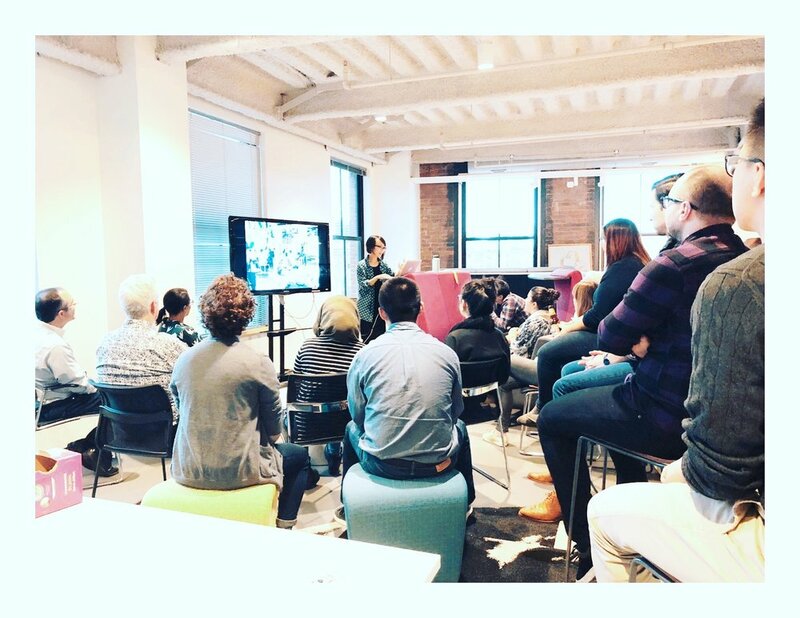 Junko Yamamoto presented the Ghana Public Art project at Imai Keller Moore Architects (Watertown, MA) and Payette Associates (Boston, MA). A group of Comprehensive Studio from RWU students traveled to Malmö and Klippan with Roberto Viola Ochoa to experience the architecture and landscapes of Sigurd Lewerentz. The studio is focusing on designing projects within the Malmö Eastern Cemetery, one of Lewerentz’s work that spanned most of his professional life, from 1919 to 1975. Given the duration of the project it gives us a good insight on how Lewerentz’s approach evolved over the years. The students begun to understand in more detail the level of complexity in his work, so difficult to grasp through readings or photographs. In Klippan we had the opportunity to visit St. Petri, consider his masterpiece. We were guided by Anders Clausson, a chemist, resident of Klippan, who fell in love with the church decades ago, and who has become an unofficial guide and point of references for all questions regarding St. Petri. He showed us every corner of the building, including the basement, he shared with us numerous anecdotes that helped us develop a better understanding of all the complexity and symbolism hidden in the design. In the Eastern Cemetery in Malmö we were guided by Mrs. Pia Andersson and Mr.Carlsson, who provided access to all the hidden corners of all the chapels and crematorium in the cemetery. The students were also exposed to the richness of the landscape settings which make of this cemetery an idyllic setting. We are pleased to announce that iVY Design Associates has been awarded third prize in the 2018 International Architecture Awards for our project Sevigny-Lisdero Residence in Lexington. Public Art in Ghana Complete! 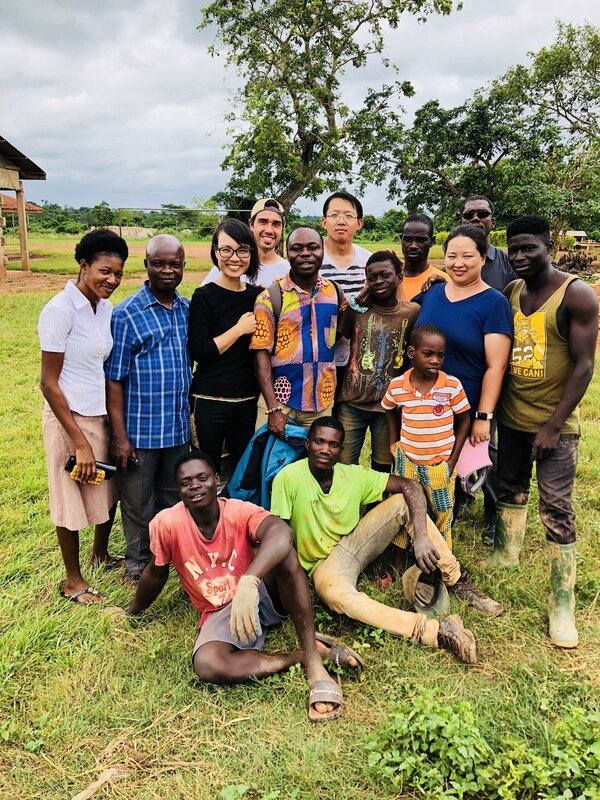 Junko Yamamoto, together with her teaching assistant, students from Boston Architectural Collage, and the Korase people, has completed public art installation in Ghana. The installation took place in Korase, a rural village near Kumasi, Ghana. The Boston team (Junko, Matt, Cenxue, Ren) has stayed in the adjacent village Kwaso for two weeks to complete the construction. Junko stayed an extra few days and completed the wall painting. Many thanks to all the people who supported and helped the team complete the project. Roberto Viola Ochoa was invited to participate in the 10th anniversary of the Catedra Jorge Montes at the UNIS in Guatemala. As a subject, the muse of most architects, the Barcelona Pavilion by Mies van der Rohe and Lilly Reich was selected. Its ambiguous structure, spatial qualities and its playful, and at times mischievous, reflections construct an experience that even today is magical. The Fundacion Mies has invited architects and artists over the years to temporarily intervene in such charged condition. In the spirit of these types of exercises, the students were asked to create an experience within the experience that had to have its genesis on some aspect of the pavilion they found deserved to be highlighted. 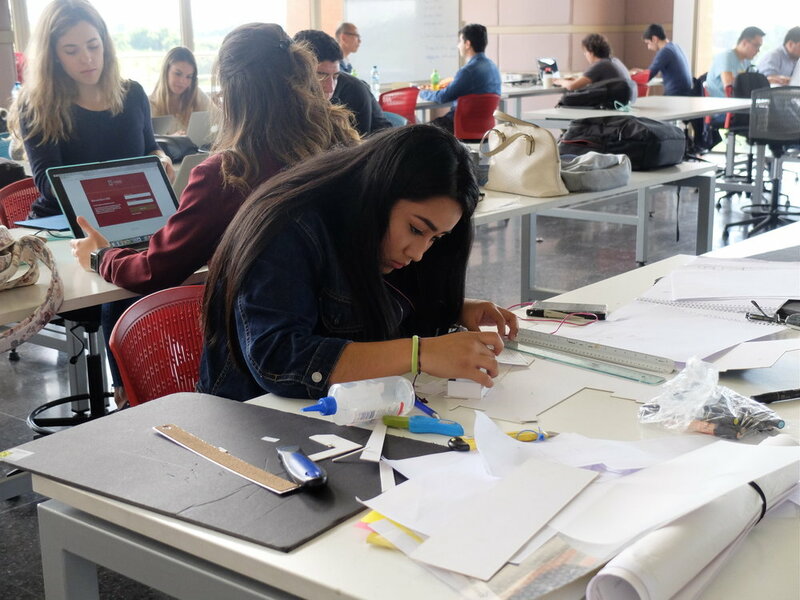 There were six teams composed of architecture and interiors students from UNIS and the Universidad Catolica de El Salvador. A fruitful 2 days of work resulted in a wide range of projects that included an homage to Lilly Reich, a ghost, flooded voids, playful fabrics and viewing platforms…………all sharp and specific about the questions asked. At the end, the proposal ‘Material Inmaterial’, a powerful play on reflections and structure, won the mini competition. 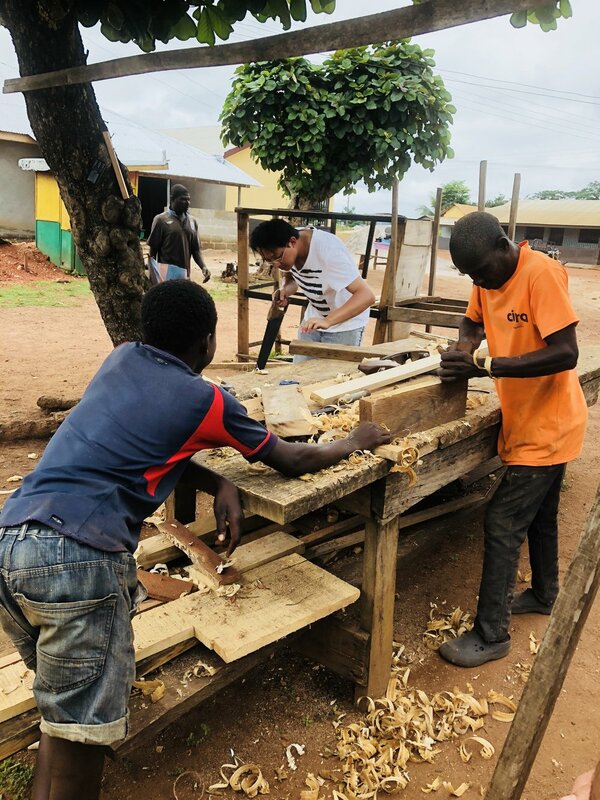 Junko Yamamoto, together with her teaching assistant and a group of students from Boston Architectural Collage, is installing public art in a rural village in Ghana in August 2018! The preparation for the project took place at the BAC, with a group of 10 students. Roberto Viola from iVY was invited by UNIS to conduct a charrette focusing on matters related to globalization in architecture. The short design project focused on the idea of learning to see, on appreciating the identity of each place as a response to the overarching homogenization the global condition brings. Students from UNIS, Universidad de San Carlos, Universidad Mariano Galvez and Universidad Catolica de El Salvador participated in the charrette where they were asked to design two dwellings for stargazing in Roccascalegna, Italy; with the caveat that it had to have its genesis in some aspect of the Domus. The participants were divided into groups composed by members of different universities and different disciplines (architecture and interiors) and they worked very hard in each proposal. At the end, the mini competition was won by Group 1, composed by Pablo Corado, Marcela Balcarcel, Laura Figueroa, Elda Cristina Sierra Hernandez and Jose Gustavo Perez Hernandez with a beautiful project titled "Casa Tra Le Stelle", in which two 'fighting sister houses' capture the landscape between walls and construct an illusion with reflective water elements. The catedra could not have happened without the incredible organization and support of the graduating class of UNIS and Roberto Enrique Sosa, UNIS Professor and Director de Estudios of the school. The students from Comprehensive Design Studio had the opportunity to present their on going work to professionals from different offices and disciplines in a gallery style review. The workshop took place with the support of SMMA's offices in Cambridge, which not only contributed with the space and the logistics, but also with a substantial number of critics. The students are dealing with a difficult question of connecting the past with the future in the city of Pompei. A challenging project that has to address questions of identity, appropriateness and the civic condition. At the end, the conversations were insightful and the group of students left inspired and motivated to continue with their search. Although the concept is not new, I feel that we have increasingly been holding discourse on the idea of “community” or something “shared.” When Ai-san and I were talking about Share Houses in Japan the other day, it reminded me. It seems that we are in need of re-defining the concept, or re-discovering its meaning. Our studio topic last semester (Kersten and David) was “commune,” and the previous studio with Atelier BowWow also had community-related design project (Kamanuma in Chiba, Japan). The discussions with those who we met during the Atelier BowWow studio trip (Hayashi-san and the local people in Kamanuma, Iida-san at Loving Pork Facility, and more), the story about “Ibasho Cafe” by Kiyota-san, and a similar communal project that Ueta-san, one of my GSD friends, showed us, and so on… While pondering on these projects and stories, I went to see this exhibition titled, “Community Fantasy and Future” by ASSEMBLE, a group of 15 artists and architects based in London. The project is wonderful. It was awarded the Turner Prize in 2015. They successfully revitalized the deteriorating Granby Streets area of Liverpool through workshop-centered renovations of the abandaned houses with the local people. Their production process is unique and artistic, which they call “speculative design.” Although the definition may vary, they define it as the area between art and design — “incorporating design as a problem-solving method while approaching art as a means of raising social issues rather than of self-expression.” This is all “art,” in my opinion. This project seems to show the inherent role of the arts, which I believe is to “connect” — connect between people, between people and objects, between people and space (whatever the type of art it is). Art becomes the source of design, which may turn into architecture and/or products. 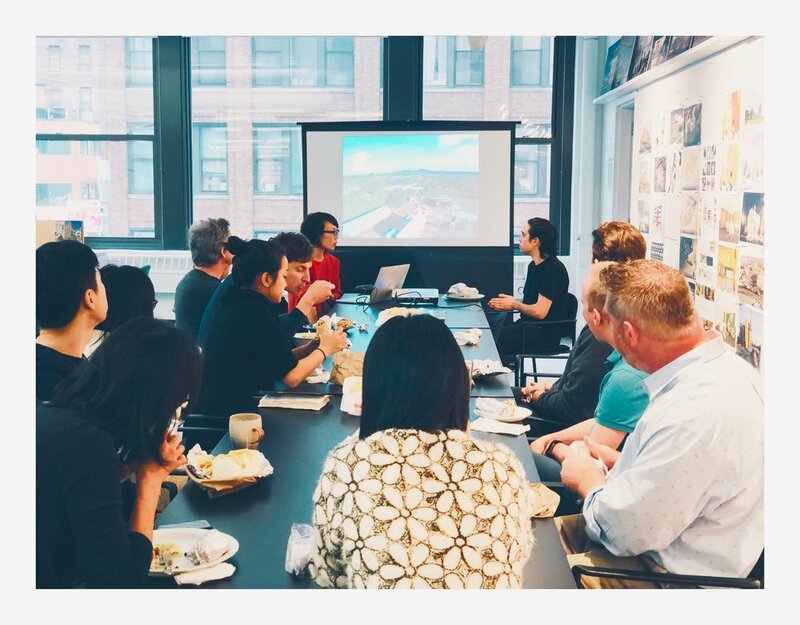 Students from Comprehensive Design Studio from Roger Williams SAAHP, lead by Nate Fash and Roberto Viola Ochoa had the opportunity to discuss their projects with Emma Rubin, Michael Shearer, Nicholas Rekstad and Aaron Einck from ARUP in Boston. Their expertise in matters of environmental, mechanical and structural engineering provided a higher dimension and rigor to the work produced by the students. The experience was a true luxury, not only for the students but also for the instructors, and it was possible thanks to the unconditional dedication from the members of ARUP, whom semester after semester give us all of their attention. 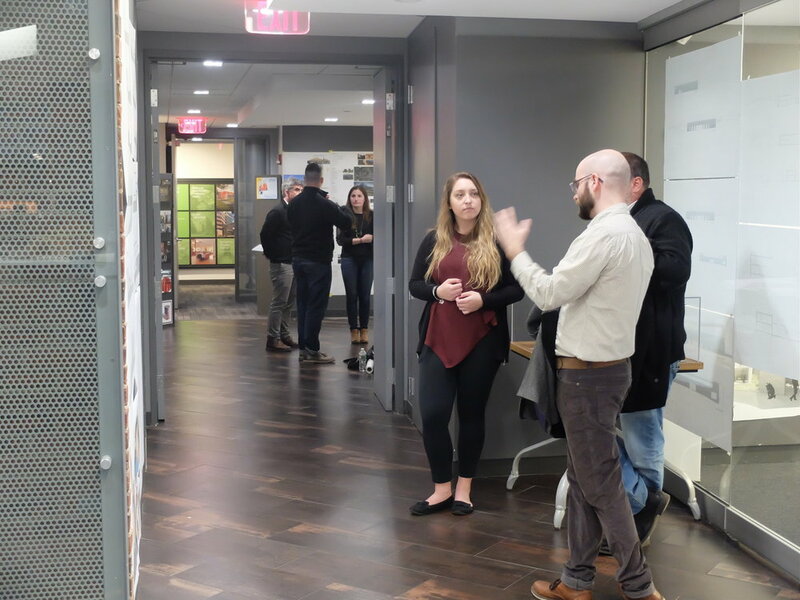 Students from Comprehensive Design Studio from Roger Williams University lead by Roberto Viola Ochoa and Nathan Fash had the opportunity to present their work at the offices of SMMA in Cambridge. 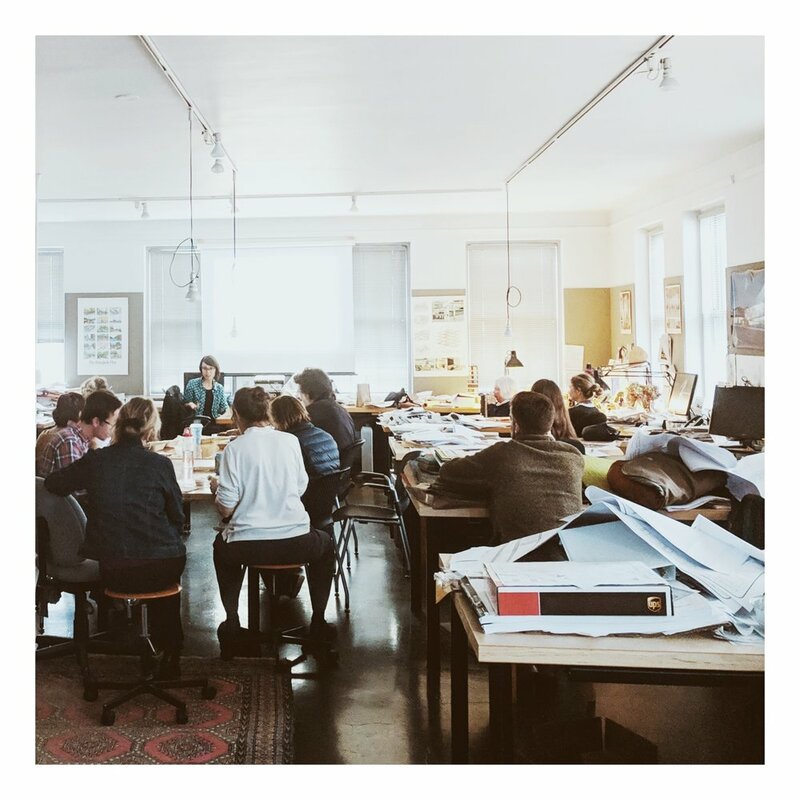 The format allowed the students to receive feedback from professionals from different disciplines, from different offices in the Boston area including iVY Design Associates Principal, Junko Yamamoto and iVY designer, Thomas Barker. The brief and intense critique sessions focused on every aspect of design, from urban/landscape strategies to the more technical layers related to systems. At the end, the students left SMMA inspired and motivated to continue to develop their projects and with a much wider understanding of all the issues involved in the design of a building. The review was possible thanks to the commitment of time and resources from SMMA who contributed with a generous number of critics and a remarkable and outstanding logistical support. A total of 42 critics and 21 students participated in this event. Our guest today was my friend, Ruben Segovia. He talked about "dictionary of images," ways of starting a project using images, and visual representations of context -- his observations of images/artworks, and the way of collecting and visualizing site information were very interesting and inspirational. 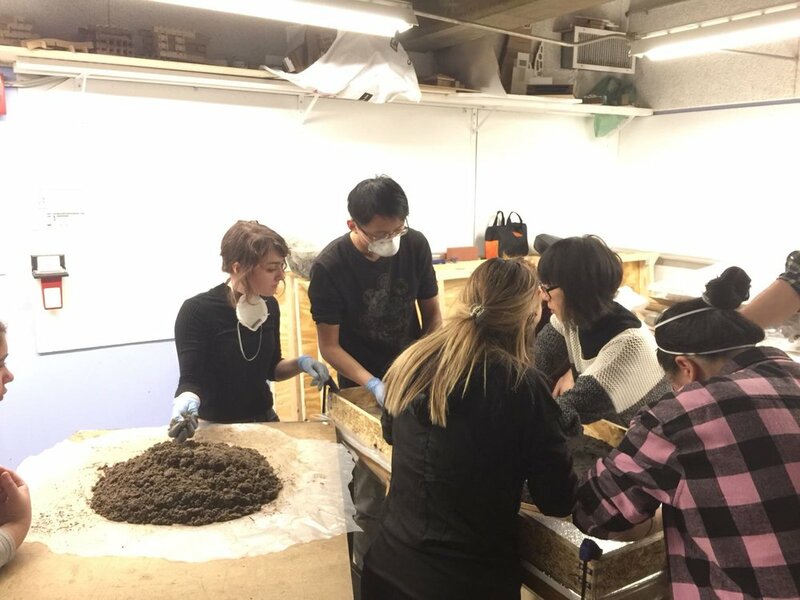 The Comprehensive Studio class from Roger Williams University taught by Roberto Viola Ochoa traveled to Copenhagen to get acquainted with the sites currently under study in the southern district of Sydhavnen. The visit allowed the students to become aware of the qualities of this emerging neighborhood with a very particular urban structure in which building, water and parks are in perfect balance. The students also had the opportunity to visit different sectors in the city and develop a better understanding of how it grew and developed over time. In addition, the group visited the church in Bagsvaerd by Utzon and the Mälmo Cemetery by Lewerentz, in Sweden. These visits were informative to generate discussion on questions related to ritual, procession, context, symbolism among others being studied in the current semester. Our guest this time was my former boss and friend, Randall Imai. His presentation included slides from his talk at Urban Design class at MIT - Interesting discussion about 'diagram' from the urban design perspective, as well as his incredibly detailed, story-telling hand-drawings. The proposed use of space and the narrative are well articulated and effectively communicated through his 5-color hand drawings. Students at Harvard Graduate School of Design with professor Ewa Harabasz visited two New York artists this past Saturday: Mark Dorrance and Anton van Dalen for the “Drawing for Designers: Technics of Expression, Articulation and Representation, ” course. The Universidad del Istmo (UNIS) in Guatemala invited Roberto Viola to participate in the Catedra Jorge Montes 2016. 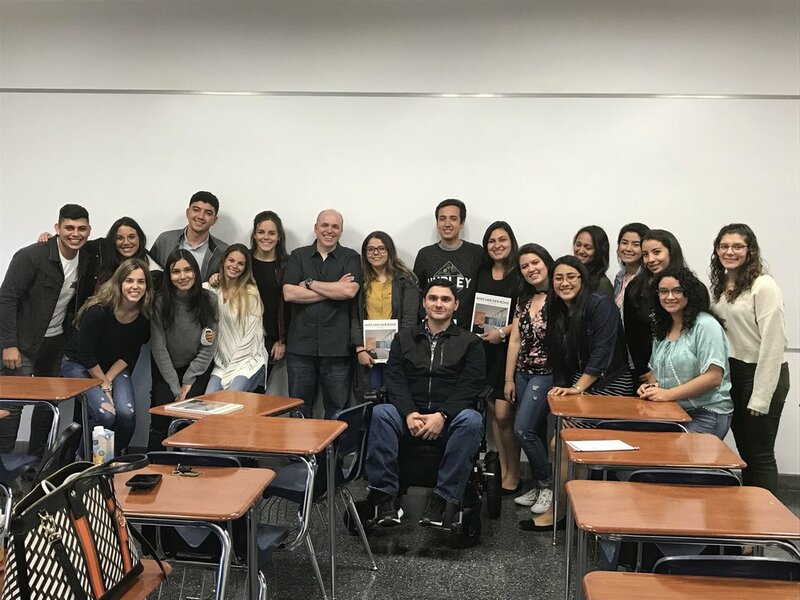 A series of lectures, conversations with faculty and students were organized by an amazing group of students lead by Lourdes Monterroso. 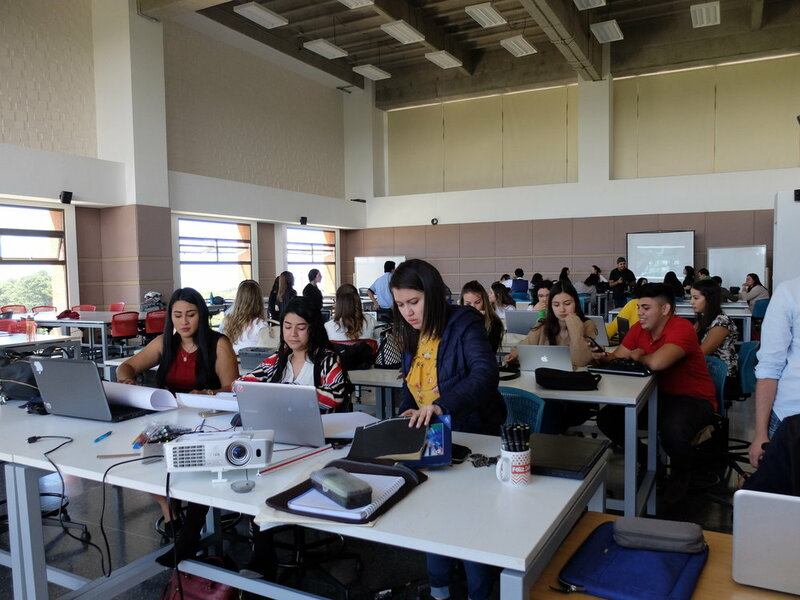 As part of the event, a three day design charrette was organized in which a group of students from several schools in Guatemala conceptualized a design for a hypothetical Social Center for Refugees in Zurich (loosely based on a similar exercise offered at Roger Williams). The exercise was lead by Roberto in collaboration with architect Roberto Enrique Sosa, Professor at the UNIS. This was a chance for students from Guatemala to get exposed to other ways of approaching design in an unfamiliar and radically different environment. A total of 5 groups participated, each with 4 to 5 members. Each team presented a proposal at the end of the 3 day charrette and a winner scheme was selected by the participants. At the end, the project named Ubergang design by Mildred Jeaneth Ortega, Byron Javier Cardenas, Maria Celeste Castaneda and Ana Marleny Carias took the first prize. 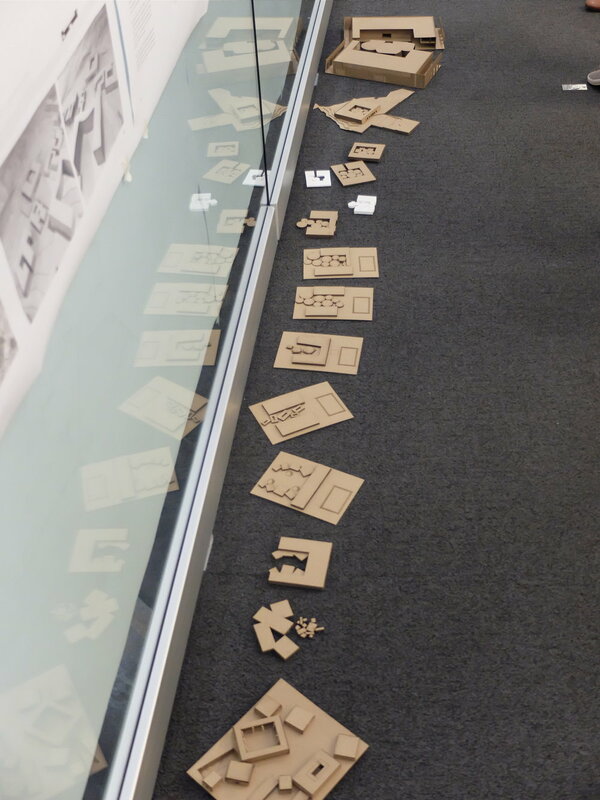 On Friday, April 29th, students of Comprehensive Studio for the Spring Term had their final review. The students produced outstanding work at all levels, from the conceptual to the technical, on very challenging sites in Chicago and Zürich. During the final review, they had the opportunity to get feedback from many of the faculty members of the school and architects representing different firms in the area. The format is such that it allows each student to have focused discussions on the more specific details of some of the technical components of their buildings such as structure, envelope and mechanical systems. On Monday, April 25th, the students from Comprehensive Studio from Roger Williams SAAHP, had the opportunity to discuss their projects with Patrick McCafferty, Michael Shearer, Nicholas Rekstad and John Mackenzie, some of the leading engineers from ARUP in Cambridge. 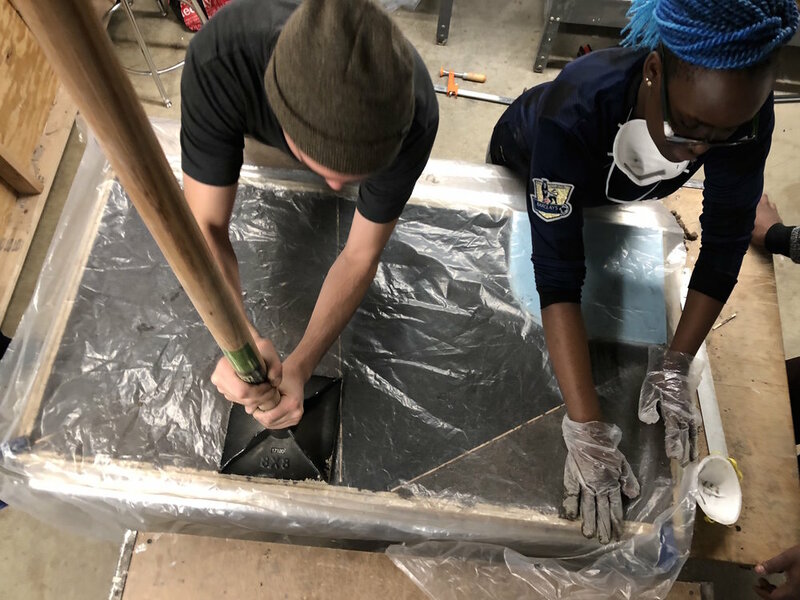 The hands-on work session is organized every semester and focuses on structural and mechanical systems and its integration in the design process. Patrick, Michael, Nicholas and John have been active participants in these sessions helping each student refine and improve their concepts. The introduction of these work sessions has had a significant impact in the work produced in the studio over the last few years, and have been a true privilege not only for the students but also for those of us guiding them in this challenging course. From a pedagogical standpoint, the intention is for the student to learn to explain ideas and intentions to consultants, in a situation not dissimilar to real practice.